According to the company, the 6.5-foot-tall Handle is an experimental prototype that can lift up to 100 pounds. 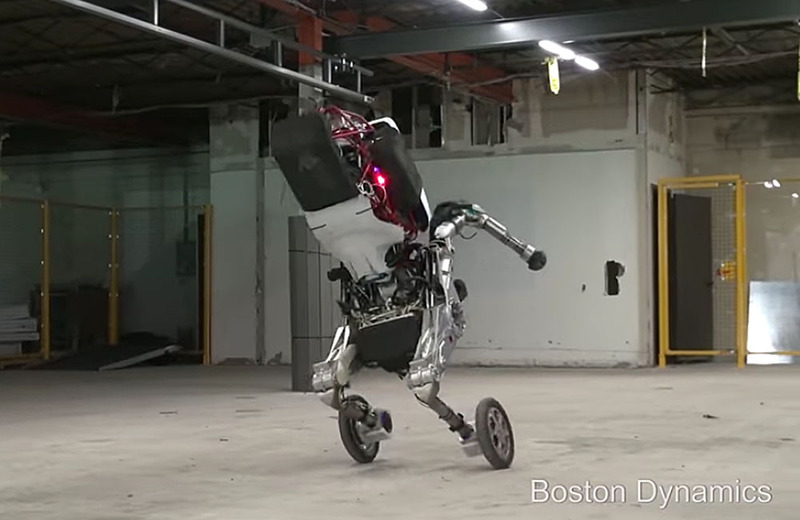 Its battery allows it to go for a range of about 15 miles at a maximum speed of 9 miles per hour before needing to be recharged — which is significantly more than other two-legged robots can boast. The company told IEEE Spectrum that though the concept for building a wheeled robot had been floating around for a while, the company’s engineers only were able to begin development last year. In order to accelerate the process, they used the same components for power, arms and upper body that were originally made for Atlas, one of their previous designs created for traversing rough outdoor terrain that is electrically powered and hydraulically actuated. You can see the resemblance: Handle sports the same white upper body design, but differs slightly in that it uses both electric and hydraulic actuation. This allows it to make sharp movements and turns, or leap four feet into the air relatively quickly. On the other hand, the software used to control both robotic prototypes has similar balance and dynamic control principles. 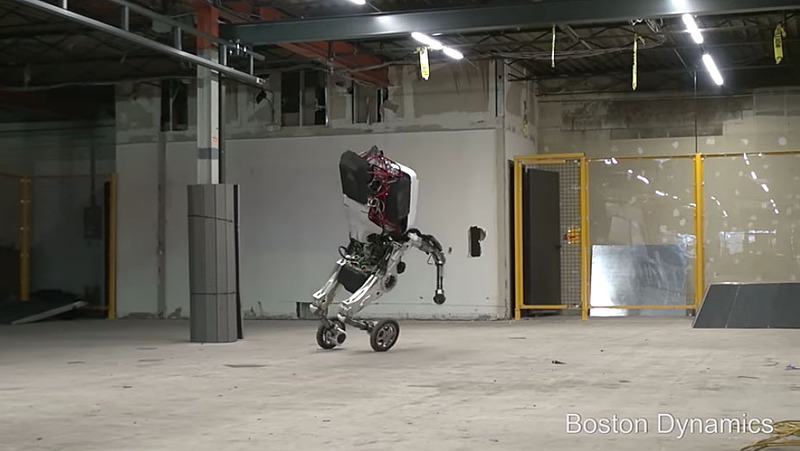 This incredibly nimble robot can seem amazing, but also “nightmare-inducing,” as Boston Dynamics’ founder and a former professor at the Massachusetts Institute of Technology, Marc Raibert, joked when he introduced Handle at a conference last month. 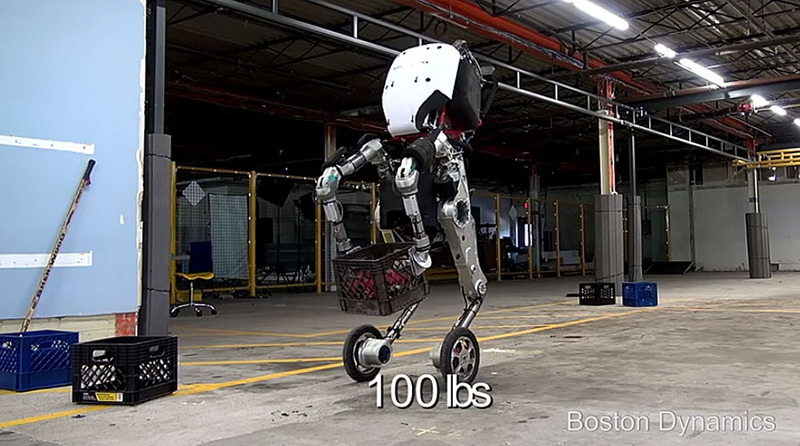 One can see why: an army of these would overrun us wheel-less humans in a matter of moments — yet another sign that the robot takeover is imminent. There’s also the possibility that humanoid robots are treading into the territory of the so-called “uncanny valley” — the theory that as robots resemble more and more human-like, they become creepier and creepier to actual humans. The name refers to the feeling of uncanniness that’s provoked when humans encounter something that looks like a human but isn’t, leading to a lack of an empathetic response toward the object, which may be a robot, a computer-generated animation or even a realistic-looking doll. This effect has prompted some experts to warn against the creation of humanoid robots, as it may lead to “abusive behaviors” toward these robots. In any case, it seems highly unlikely that development of humanoid robots will cease, due to the mere possibility that someone will feel uncomfortable around them. 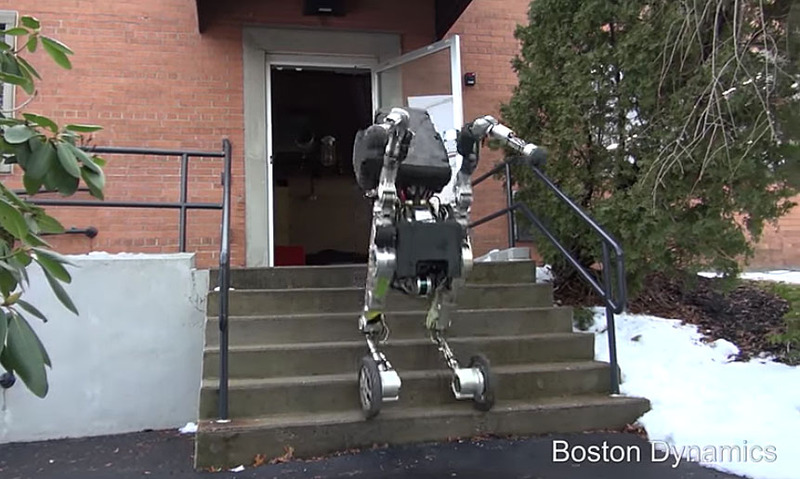 With its wheels and menacing agility, Handle seems less human than something straight out of a cyberpunk novel. So who knows what might be next — perhaps robots that can switch interchangeably between wheels and legs, or something in-between?